Favourites Brazil and Neymar take on a talented Belgium side in the World Cup quarter-finals on Friday while an exciting young France team led by emerging superstar Kylian Mbappe must pass a tough test against Uruguay. 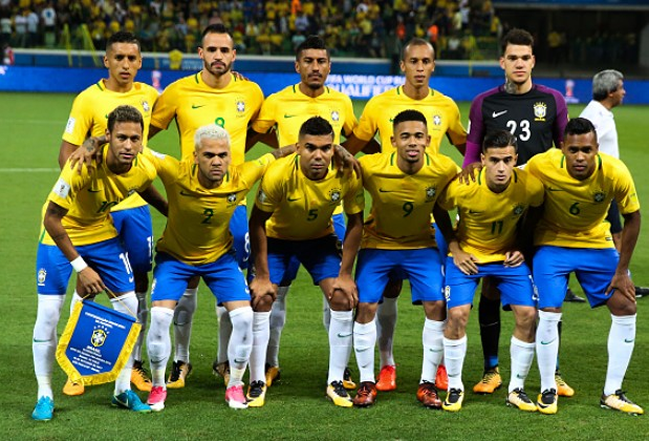 As the World Cup bursts back into life, Brazil are aiming to continue on the path towards winning a record-extending sixth World Cup at Moscow’s Luzhniki Stadium on July 15. But first, Neymar and his star-studded supporting cast have to get past Belgium, who boast an array of their own firepower, to reach the last four. In a Kazan Arena expected to be awash with yellow-clad Brazil fans at the 1800 GMT kickoff, Belgian trio Eden Hazard, Romelu Lukaku and Kevin De Bruyne have a chance to prove they can cut it at the highest international level after so many disappointments. Belgium coach Roberto Martinez acknowledged the gulf in World Cup pedigree between his side, who have never been further than the semi-finals, and Brazil. “They know how to win World Cups, they’ve done it more than any other nation so they have that psychological barrier out of the way,” the Spaniard said. “Of course we want to win and we’re going to try to win. The most important aspect tomorrow is our chance to play in the quarter-final. “We want to enjoy our game.” Brazil coach Tite said he was desperate to win without resorting to the “horror” of penalties after three of the last-16 ties were settled by spot-kicks. “A football match should never be settled with the horror of penalties. I don’t see that as a valid result,” Tite said Thursday. “For me, there has to be another way.” Brazil made a slow start in Russia but hit their stride with an impressive performance to shut down Mexico in the last round. All eyes will again be on Neymar’s performance. The world’s most expensive player has attracted praise for his goals and fierce criticism for his play-acting at the merest contact from an opponent. He has brushed off the barbs, saying: “I don’t care much for criticism, or praise, because this can influence your attitude.” – Waiting on Cavani – France overran Argentina in a last-16 match that appeared to signal the passing of a torch to a new generation of superstars, as 19-year-old Mbappe scored twice to outshine Lionel Messi and dump the 2014 finalists out of the competition. Nobody in the French camp is under any illusions that Uruguay will give them the acres of space they enjoyed against the disorganised Argentine defence. “Uruguay have so many assets, so many qualities,” said France coach Didier Deschamps. “They defend as a unit, they play together and they love to do that.” Uruguay will make a last-minute decision on whether prolific striker Edinson Cavani will play after he suffered a calf injury in his impressive two-goal performance that ended the hopes of Cristiano Ronaldo’s Portugal. Cavani was back in training on Thursday and France are acutely aware of the threat posed by the man who plays for Paris Saint-Germain. “I am preparing my team for if Cavani plays,” Deschamps said, adding he would only know 90 minutes before kickoff. France are likely to draft in Bayern Munich’s Corentin Tolisso in place of the suspended Blaise Matuidi to add steel to their midfield. In England, World Cup fever is building as hopes rise that Gareth Southgate’s young team can beat Sweden on Saturday and reach the semi-finals for the first time since 1990. Southgate has urged his young squad to seize their chance. “It’s a great opportunity, and although our team will be individually better in two years, we might not have this opportunity again,” he told the BBC. Even if England do reach the final, British political leaders and royals will not attend the match in Russia. The boycott imposed over a nerve agent attack on a former Russian spy living in southwest England has taken on new significance after a fresh case of exposure to the same poison nearby. FIFA President Gianni Infantino told President Vladimir Putin that everyone had fallen “in love with Russia” during the World Cup, during a meeting Friday at the Kremlin. “Everyone who has been here for a period of time now has discovered a country that we didn’t know,” Infantino said, flanked by former stars including England’s Rio Ferdinand. England or Sweden will play the winner of Saturday’s other quarter-final, in which host nation Russia hope to keep their rollercoaster ride through the finals going when they play Croatia. Written off as no-hopers before the tournament, Russia are now within reach of their first World Cup semi-final since 1966.